Not quite two years ago, White River Junction's Northern Stage was on the cusp of the biggest challenge in its history: building a new state-of-the-art theater with a $7.4 million price tag and fundraising $9 million for the construction and the recapitalization of the company. With more than 100 productions to its credit and upwards of 24,000 attendees annually, the professional regional theater company had earned its own venue — it's been performing since 1997 in the Briggs Opera House. But it was 2013, and the country was just dusting itself off from the recession. Besides, the company had never attempted a campaign of this magnitude. Northern Stage has made some good decisions. The board made the first in 2013 when it hired artistic director Carol Dunne and managing director Eric Bunge and charged them with getting the company into a new home. Dunne forged relationships, engaged audiences and grew support. Bunge brought a different skill set. Northern Stage could take advantage of his experience building a new venue for a similar-size group he'd founded in rural Minnesota, Commonweal Theatre Company. "I think Eric was trying to avoid the trap of dragging the project out," says Irene Green, director of sales and marketing. "People can get fatigued." To speed things up, Bunge figured out a timeline for planning, building and fundraising that would maximize effort and minimize cost. Conventional wisdom says to raise all the money before building, but Bunge calculated that waiting just one year would significantly raise the costs of fundraising, consulting and construction. "There was a $700,000 advantage to getting started sooner," he says. The company broke ground on the new 17,000-square-foot structure — to be called the Barrette Center for the Arts — on Gates Street last October. Northern Stage will launch its 2015 to 2016 season this October, if all goes according to plan. So far, the construction is on time and under budget. According to Bunge, the company has raised $7.8 million toward its goal. "Our first ask was a little over a year ago," he says. "We're blown away by the support of our community," Dunne adds. "We weren't sure if we could make this dream come true." Within six months, Dunne says, it was clear that locals wanted to support the company. Bunge is particularly appreciative of support from the Town of Hartford, through which all the permitting has been done. (White River Junction is one of its five unincorporated villages.) Showing local support in return, Northern Stage has tried to use subcontractors within a 40-mile radius, "which quadruples, at least, the economic impact of what we're doing here," Bunge says. 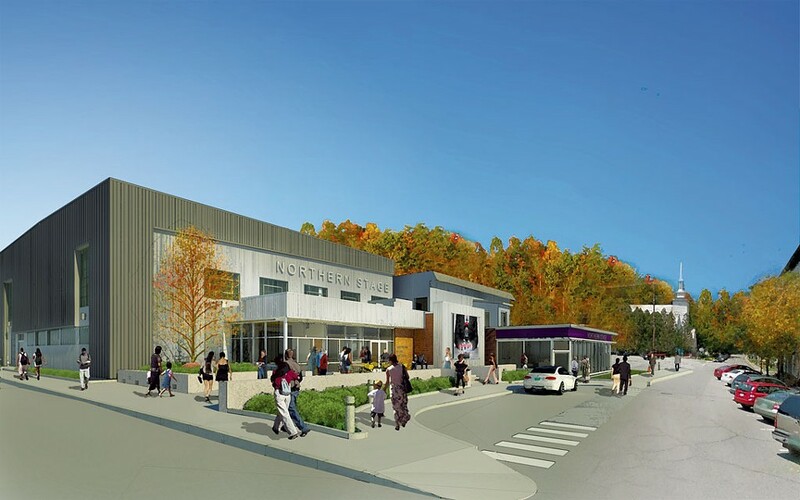 Bread Loaf Corporation of Middlebury and the Connecticut office of international Theatre Projects Consultants developed designs for the new venue in concert with Northern Stage. As the design/build firm, "Bread Loaf listened to us and didn't try to impose a theater on us," Bunge recalls. "Our patrons asked us to 'make the rows wider, make the seats wider, but keep it intimate.'" The historic Briggs Opera House has been a good home for Northern Stage, but the company had long outgrown the physical limitations of the aging facility; low ceilings curbed the use of even 20th-century technology. On a hard-hat walkthrough of the 240-seat Barrette Center with Seven Days, Dunne stands on the platform that will be the modified thrust stage and eyeballs the short distance from the stage to the audience. All the sightlines will be unobstructed, and there will be more room between the rows of seats, she observes. "Height is the most profound difference," Dunne says. "Now we can light. We'll be able to do projections." The new building has a ceiling three times higher than that of the Briggs, and a fly system will allow for "flying" stage walls and set pieces on and off stage. "We'll actually be able to lower someone onstage," Dunne adds, perhaps hinting at things to come in this fall's production of Mary Poppins. The large ground-floor lobby will accommodate a concessions area — Northern Stage has applied for a beer and wine license — as well as coatrooms and ample, accessible restrooms. "The sound system and acoustics will be top-notch," Dunne notes, and will include a hearing-assist system. An elevator will transport audiences to the second-floor lobby. Accessible seating will be available in the first and last rows of the theater. Just steps away, Northern Stage will continue to use the old Miller Auto showroom and storage areas next door for offices and other activities, as it has since it purchased that building in 2008. Theater banners hang in front of the tall showroom windows, announcing productions with a grand swagger. Green and Bunge wax enthusiastic about unsexy but important stuff, such as a convenient drop-off for theatergoers near the entrance and the 169 parking spots in the town lot behind the theater. The building's Galvalume metal exterior exudes a contemporary industrial aesthetic, which is reinforced inside by exposed sprinkler and conduit systems and structural steel elements. "We're a theater factory," Bunge says. "We make theater here." Other areas behind the stage include a large rehearsal space and classroom, production-support spaces, dressing rooms, a green room, a kitchen and a wardrobe room. The most obvious external change is that now passersby can see Northern Stage. On the second floor of the opera house, it lacked a street presence. "You say 25,000 to 30,000 people come to your place. We don't see it," Bunge says, explaining the problem of being virtually hidden. "It's funny how people begin to take you more seriously," he says of creating a new theater. Mimicking public response, he jokes: "You mean, you actually put on 144 performances, six plays, ran camps, fundraised and built a building — this year?!" Yes, Northern Stage did just that. And there's so much more to come. The original print version of this article was headlined "Northern Stage's Theater-in-the-Works Moves Closer to Opening Night"